Disclosure: I received this product free of charge for the purpose of this review. As the youngest of three kiddos my little guy gets a lot of hand-me-downs. He has an older brother that we saved everything from so that's just the way it is for the boy. But there are some things, like hooded bath towels, that can only take so many years of use and washing before they start to get worn out. 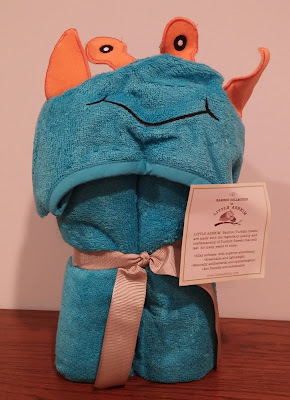 Luckily for baby boy he is getting spoiled now with a new hooded bath towel of his own and not only is it his and only his, but it is the softest bath towel I think we have ever used. The hooded Turkish towel is part of the Bamboo Collection from Little Ashkim. Their bamboo Turkish towels are made with the legendary quality and craftmanship of Turkish towels. Our Alien towel is so soft and comfy that I wish I had one of my own. It is perfect for your baby's delicate skin and it will keep them warm and cozy after their bath. The absorbent and quick drying towel would also be great for trips to the pool. I chose the Alien out of several hooded towel options because I loved the blue color and the design is unique and fun. 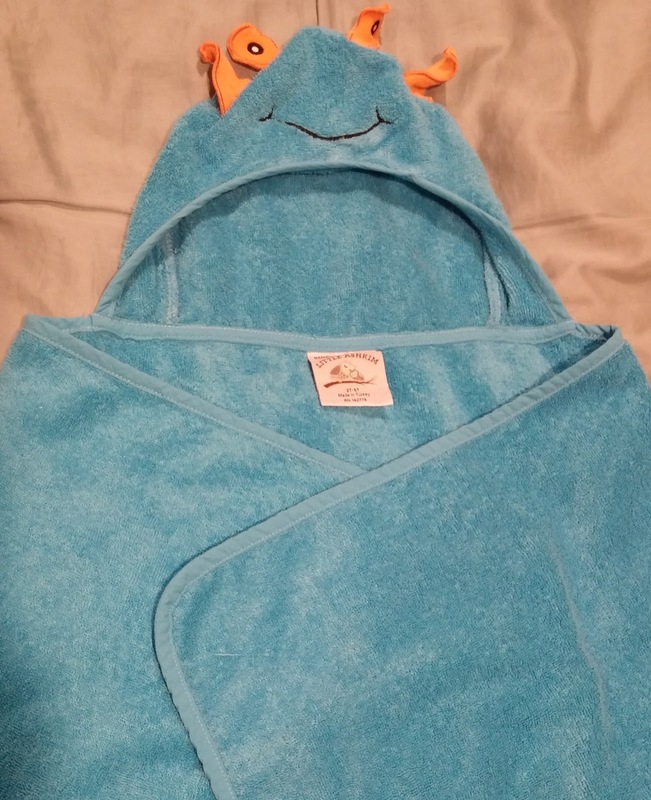 My son loves his special "monster" towel and its silly eyes. The toddler sized towel is very large and made for kiddos in 2T to 5T. You'll find that it is lightweight and breathable. The towels are also naturally antibacterial and hypoallergenic along with being eco-friendly and sustainable. And because these towels are made to last this alien should be with my guy for many years to come without looking too worse for the wear. I think these towels would make an awesome baby shower gift. You can see all of the styles available at LittleAshkim.com along with a selection of durable and soft clothing for boys and girls. Right now you can receive save 25% off your entire order at LittleAshkim.com! Just be sure to use coupon code FRIEND at checkout. 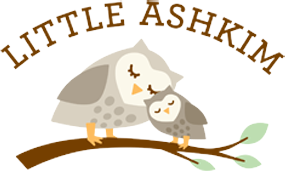 Support this company that was started by a mom by LIKING Little ASHKIM ON Facebook! You can also follow Little Ashkim on Pinterest.